That question was posed this last weekend by a woman from Chicago as we hiked through the conifer forests high above Boulder, Colorado. I had traveled to the Rocky Mountains for the weekend to meet up with my parents, my sister, and her boyfriend, to enjoy the longest day of the year from a high vantage point. As often happens in the mountains, we made a new friend on the trail. It’s a good question, though. What is hiking in Arizona like? A month ago, I was serving as the teaching assistant for a field ecology course for the University of Arizona. 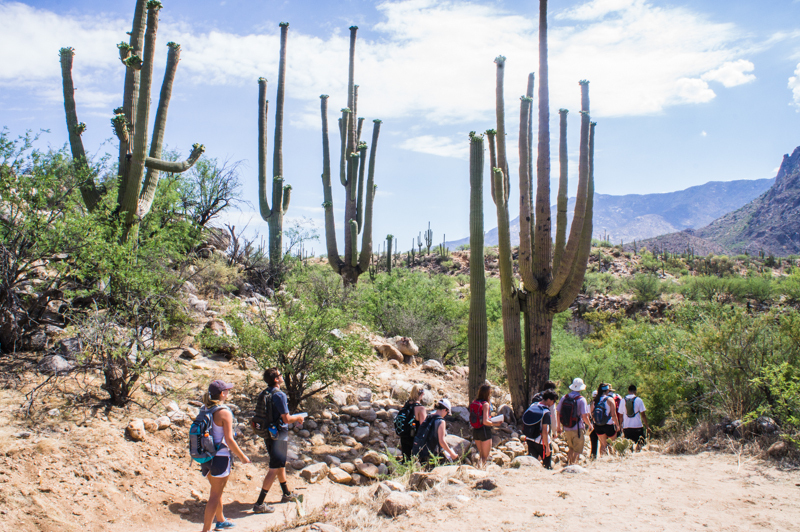 We explored some of the reasons why the geology, flora, and fauna of the Sonoran Desert is so diverse and dramatic. That diversity means hiking in Arizona can be like many different things. The classic image of Tucson or Phoenix is that of the giant saguaro cactus (Carnegiei gigantea) and bare ground. It is true that hiking around Tucson involves a lot of dry washes, loose rock, thorny and spiky plants, and venomous animals. This time of year, it is beastly hot even near sunrise and sunset, with little relief. But southern Arizona is dotted with mountain ranges between the wide basins of desert. The change in elevation creates distinctive changes in the temperature and moisture conditions, and support isolated islands of distinct biological communities. Travel only a little higher in elevation, say, to the foothills of the Santa Rita, Patagonia, or Dragoon Mountains, and you will find a grassy savannah like view dotted with trees. Some students were so close to expecting a lion or elephant to emerge from behind the tall grass that their Facebook photos convinced friends back home they had taken an African safari. Travel higher into the mountains, and they become steeper. The mesquites (Prosopis spp.) are replaced by oaks (Quercus spp. 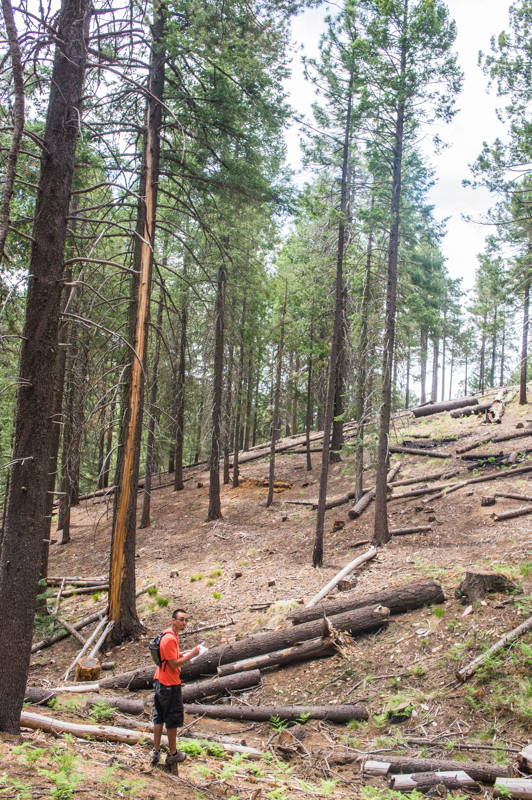 ), which turn over into pines (Pinus spp) and eventually even quaking aspens (Populus tremuloides). These elevations, slopes, and forests feel not so different from hiking in Colorado. The gathering thunderclouds on the solstice even felt like the monsoon we are waiting for in Tucson. Many Tucsonans have noticed this on their annual trek up Mount Lemmon to see real life snow on the one or two days the clouds dump up there each winter. (I hear it used to be more frequent, but not in my five year experience.) But why are the mountains here, and why do the plants and animals change with elevation? 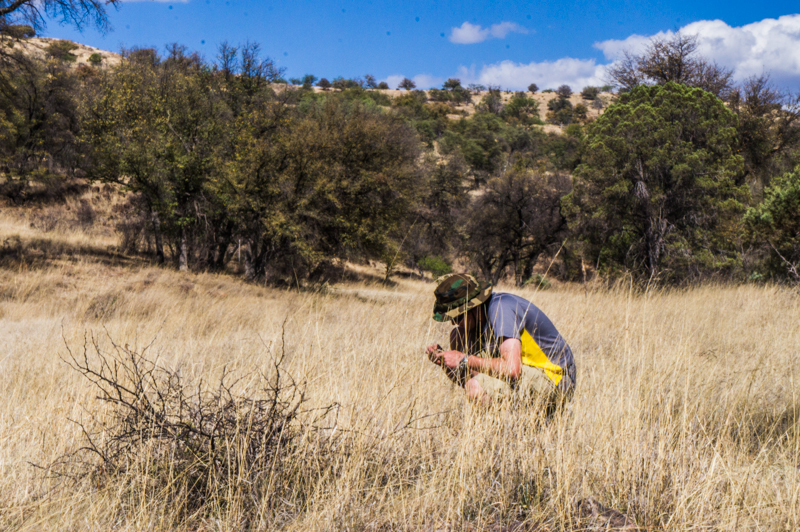 These questions have captivated ecologists for more than 100 years, since the Carnegie Desert Laboratory was founded at the top of Tucson’s centrally located Tumamoc Hill. Well known ecologists have recorded the change in vegetation in the sky islands surrounding the lab, using the corresponding gradients of temperature and precipitation to theorize about their role in determining plant assemblages. The short answer is that long, long ago, tectonic plates collided, created stretching forces in the Earth’s crust that led to volcanoes popping up throughout the region (perhaps more on the geologic story in a future post). During the Ice Age, the plant life of the region probably looked like the the tops of our mountains do today (perhaps more of this coming, too) – except with woolly mammoths and other megafauna trampling them (and watch for more of this)! As the climate warmed, those species either could not survive in the hotter, drier environment, or were excluded from the area by species that found an advantage in hotter, drier conditions that migrated north from tropical regions (more of this definitely coming in a future post). The process of adiabatic cooling creates colder but also moister conditions at the tops of these mountains (more on this later). You can learn more about sky islands and hiking in Arizona from Brusca and Moore’s new book, A Natural History of the Santa Catalina Mountains. Hiking in Arizona is like, well, like hiking in Mexico. Like hiking Canada. Like hiking in Europe, or in Africa. Why it is like hiking in so many different places inspires questions about geology, chemistry, physics, molecular biology, ecology, and other scientific disciplines. As we head deeper into the most miserable of the Sonoran Desert’s five seasons, lend me your eyeballs (and your ears) and let me renew your interest in this unique region. For the past 3 weeks, I served as a graduate teaching assistant for University of Arizona’s field course on the Sonoran Desert. At the same time, I was drafting and revising a manuscript with collaborators for a special journal issue on species interactions in the region. It has been a fantastic time to step back from my narrower research questions to consider the broader context of the environment in which interactions occur. Let me say first of all that the five seasons of the Sonoran Desert include summer monsoons, autumn, winter, spring, and the arid foresummer. Guess which one we are experiencing now in Tucson! The key to much of the moisture and diversity in this subtropical, semi-arid region is the Gulf of California (also known as the Sea of Cortez). It is home to a unique endemic porpoise which that may soon be extinct, a strong fishing culture that is slowly learning to fish more sustainably, inspiring researchers and educators at CEDO Intercultural, and a literary and ecological legacy from the trip that John Steinbeck and his friend Ed Ricketts took in the 1940’s. 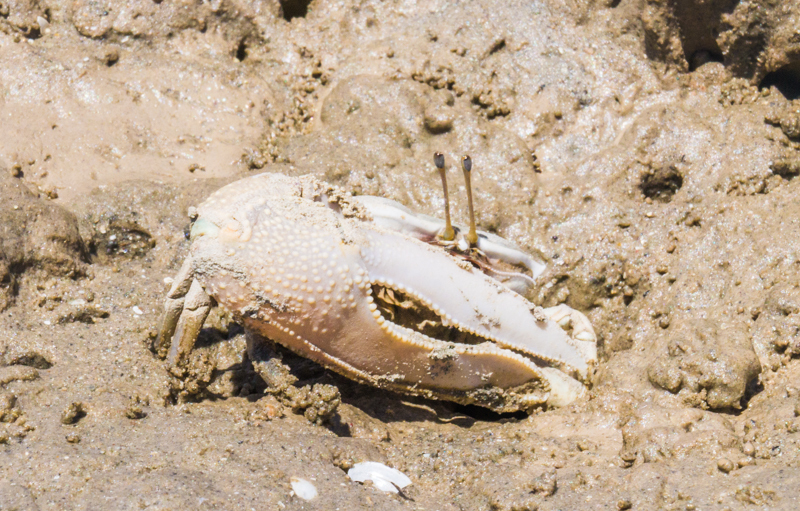 It is also the home to several species of fiddler crabs, which provide endless entertainment and substantial numbers ready volunteers for research projects on their behavior, morphology, and density. Additional note: Stay tuned for Biosphere 2‘s renovations emphasizing the regional importance of the desert sea!